Our Hotel's Amenities Please Paramus, NJ VisitorsBest known for its unparalleled shopping, Paramus is also within easy driving distance of New York City, so our guests will never experience a dull moment! 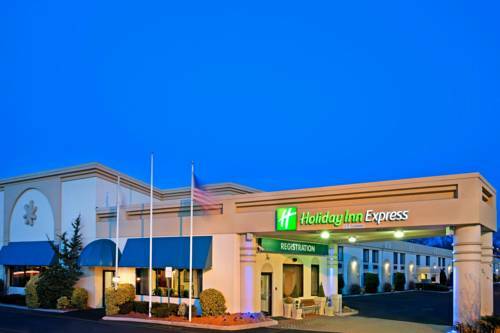 The 100% nonsmoking Holiday Inn Express Paramus hotel also features comfortable, practical amenities, so you can enjoy your stay in Paramus, NJ.Our hotel's business travelers can always take advantage of the modern business center, which features print and copy services, as well as computer access. We provide free high-speed, wireless Internet access throughout the hotel, as well as complimentary, wireless remote printing. If you're looking for hotels in Paramus, NJ near area businesses, you'll be glad to know that we are near IBM, as well as Equifax Holy Name Hospital and Englewood Hospital and Medical Center.While in Paramus, you can easily visit the Westfield Garden State Plaza Mall, Shops at Riverside or Secaucus Outlets. Families enjoy catching a game at Yankee Stadium or visiting the picturesque Bear Mountain State Park. If you prefer to stay indoors, the Izod Center provides awesome entertainment. New York City is also within driving distance of Paramus, NJ.Our hotel provides free Wi-Fi access throughout our hotel's accommodations. While in Paramus, NJ, start your day with a workout in the fitness center and enjoy the free, hot Express Start Breakfast Bar. Enjoy a spacious meeting room that can be set up to your liking for 30 people (Classroom, U-Shape, Board Room, etc) and also enjoy optional features that include having lunch catered, breakfast, or snacks. Let this be a one-stop shop for meeting planners.